This is a really simple game that you can play with big or small classes. Edit and print the sheet below. 1 per student. 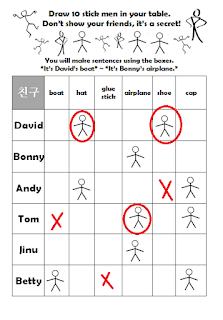 Tell the students to draw 10 stick-men (or "jolamen" in Korean) , randomly in the boxes of the table given. You should also tell them to keep it a secret from their friends. Teacher: "Minho and SeoYeon, please stand up." "Minho , ask the question 'Where is my _____?' , any box." Minho: Where is my coat? Teacher: "Ok, SeoYeon, you're next, pick a box from the top row"
SeoYeon: "It's under the table"
Teacher: "Ok, now class - is your stick man there?! Circle your stick man! " The aim of the game is to see how many stick-men you can 'save'. The winner has the most stick-men circled. 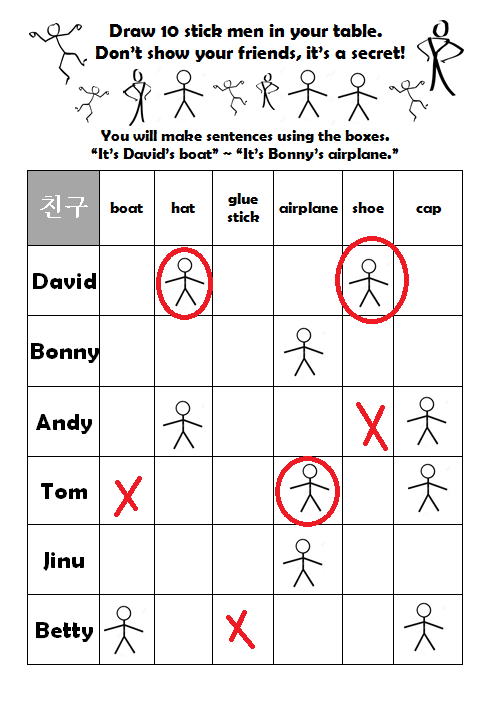 So, what I did, to limit the amount of times to make the sentences - in a small class we only did 15 turns/chances to get the stick-men. In a large class, I had every student have a chance to speak (20 kids). A great thing about this game is that the students are making sentences but also you can do this with almost any level and topic! Here's another game made for grade 5 "Whose cap is this?" lesson.